Paying college athletes: A point-by-point evisceration of the ridiculous myths that prevent NCAA athletes from getting the money they deserve. A point-by-point evisceration of the ridiculous myths that prevent NCAA athletes from getting paid. Tre Mason, No. 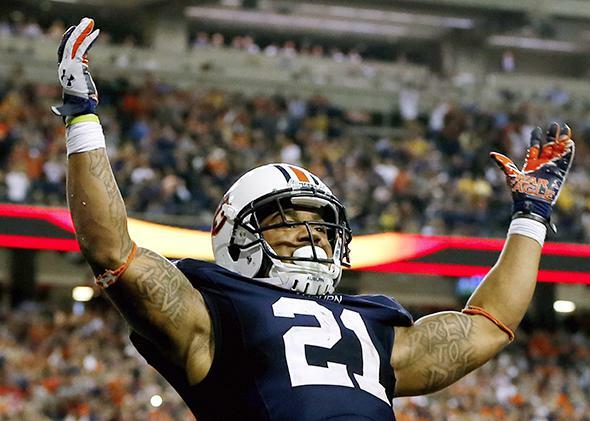 21, of the Auburn Tigers celebrates his fourth quarter touchdown during the SEC Championship Game at Georgia Dome on Dec. 7, 2013. On Monday night, millions will tune in to watch Florida State play Auburn in the last BCS title game. The schools’ conferences, the SEC and ACC, will each receive more than $20 million, which they will distribute to their member universities. Seminoles coach Jimbo Fisher and the Tigers’ Gus Malzahn both got hefty raises for leading their teams to the championship game. ESPN will profit through extensive advertising. Everyone involved will have their compensation set at market rates except for the players on the field, the ones we’re actually tuning in to see. They’ll be entertaining us for far below their market value, as a result of price-fixing by an economic cartel. I am hopeful that college athletes will soon participate in the same market economy as the rest of the college sports industry. A huge impediment to that better tomorrow are a set of myths that we allow ourselves to believe—that fans care about schools more than players, that a free market would make college football and basketball less competitive, that it would drive schools to bankruptcy, and that it’s all probably illegal under Title IX. Each of these ideas is wrong. Myth No. 1: Fans don’t care about the name on the back of the jersey. If athletes themselves had no bearing on the economic success or failure of college sports, then the market rate for an incoming freshman wouldn’t be much higher than the current maximum scholarship (some argue it would be lower!). Instead, we see that losing scholarships can hurt a program, and we all know that if the NCAA allowed its athletes to be paid in cash, they would be. That shows that players matter a whole lot. Florida State went 7–6 in 2009, and the fans yawned. This year, they finished the regular season 13–0 and have a chance to win the national championship and merchandise is flying off the shelves. Think Heisman-winning quarterback Jameis Winston might have something to do with that? Down the road in Gainesville, the Florida Gators went from an 11–1 regular season in 2012 to a 4–8 record in 2013. If fans only care about the name on the front of the jersey, why did so many fewer people tune in to watch the less-successful 2013 Gators? Even among alumni, the intensity of fan interest varies greatly based on the quality of the team, which is driven primarily by the quality of the players. I went to Stanford and always want the Cardinal to do well. But I attended a lot more games when Andrew Luck was under center than when Stanford was 1–11 in 2006. In the wake of Johnny Manziel’s Heisman Trophy season, Texas A&M demolished its previous fundraising records, raising $740 million in one year. What did the Aggies credit? “Euphoria” over the football team’s successful entry into the SEC, fueled by Johnny Football. To go one layer deeper into the data, economist Chad McEvoy and my business partner Daniel Rascher modified an NFL study done by Scott Tainsky and analyzed the importance of player quality on college game attendance and television ratings. The evidence was overwhelming: College football ticket sales and television ratings vary far more based on quality than in the NFL. The data show that fans want to win, and you can’t win without big names on the backs of all those jerseys. Myth No. 2: Paying college athletes will destroy competition on the field. As an academic discipline, sports economics is almost 60 years old, launched with Simon Rottenberg’s 1956 paper “The Baseball Players’ Labor Market.” Rottenberg theorized that regardless of the pay rules, talent generally ends up wherever talent is valued most. Rottenberg’s theory has been shown repeatedly to be correct. Ronald Coase broadened it and won a Nobel Prize. But despite the consistent evidence that free agency does not harm competitive balance, the people who keep the profits (team owners in pro sports, university poobahs in the college game) still argue that the more free agency you have, the bigger the “Yankees problem”—the situation where all of the best talent gravitates to the richest teams and fans lose interest in the sport. These aren’t theoretical arguments. Both of these claims—that competitive balance will be destroyed and that fans will lose interest in college sports if players are paid—are at the core of some of the NCAA’s recent legal claims. About that supposed “Yankees problem.” Consider that in the 16 years from 1949 to 1964, the New York Yankees won the American League pennant 14 times, and won nine of those 14 World Series, all before free agency. In the 37 years since the advent of free agency, by contrast, the Yankees have made the World Series 11 times and won seven—half as many championships in more than double the time. And even during the last big Yankees streak at the turn of the millennium, baseball’s popularity was never in jeopardy, with revenue growing every year. Twenty-first century college football has its version of the 1950s Yankees: the Southeastern Conference. The SEC has won the last seven national championships and Auburn gives it a chance for an eighth. The SEC is home to some of the highest-paid coaches in college sports—averaging more than $3.3 million each as of early November, before the most recent round of competition-fueled raises. The SEC has also dominated the NFL draft. In 2013, the conference’s 63 draftees more than doubled the number from any other conference. College football has the strictest of salary caps in major sports—there are no salaries at all. Even one car wash’s worth of water and an athlete can be sanctioned. Has this super-strict salary cap allowed the MAC to stay competitive with the SEC? Not at all: Since 1984, current MAC teams are a collective 6–65 against SEC teams. The no-salary-at-all cap has locked in competitive imbalance, much in the same way that the Yankees of the 1950s thrived because of, not despite, the absence of free agency. It’s not just the SEC. The very existence of acknowledged power conferences within the NCAA’s Football Bowl Subdivision is a sure sign there is no NFL-like competitive balance. Dozens of colleges become football powerhouses, based solely on their willingness to spend money. Even before the season starts, you can predict that the schools in Tuscaloosa, Ala., Norman, Okla., and Columbus, Ohio, are going to do well, just as they did in the 1970s, 1980s, and 1990s. That’s not competitive balance. That’s a system that perpetuates itself, with would-be upstarts scrambling to get into the upper tier before the money train leaves them behind. Absent the salary cap called “amateurism,” rich schools with eager fan bases will still spend money to win, but they will shift the money around a bit, possibly paying the next Nick Saban $3 million instead of $7 million, spreading the leftover cash out among future C.J. Mosleys, perhaps in the form of retention bonuses for using all four years of eligibility. While the recipients of the money flows will change somewhat, football powerhouses in 2030 won’t be all that different from football in 2000 or 1970. As long as college football matters more in Oklahoma than New York, Oklahoma will get better football players than SUNY Buffalo. A strict reading of Rottenberg’s theory says it won’t matter a smidge how the money flows—talent will always end up where it is most valued. To that I would add that demand for quality football is itself likely a function of a steady history of quality football: Fans develop a taste for winning if they see it enough. Oregon forced its way into the elite through a massive construction program and is now a “football school” because, like the sports version of Say’s Law, exposure to high-quality football can create its own demand. Market competition for talent would allow more teams to grow demand for the sport. While typical businesses attract talent through compensation, college football programs have to rely on space-age uniforms and concrete-and-steel palaces, like Oregon’s $68 million facility. In the competitive world, paying the going rate for top-tier talent like Tahj Boyd would cost less than building a gridiron Taj Mahal. Myth No. 3: Everyone will go bankrupt. With all this competition for on-field talent, won’t schools run out of money? After all, if you take schools’ accounting at face value, hardly any of them make money on sports at all. Stop right there. As economists Brian Goff and Dennis Wilson explain, sports aren’t actually a huge money loser. Rather, schools cook the books in an effort to look poor. [A]thletic “deficits” reflect the accounting practices of universities or the flow of revenues back into expenses rather than the inability of revenues to meet costs. … Within athletic departments it can flow into salaries for athletic staff (coaches, athletic directors, support personnel) or into facilities. Beyond the athletic department, it can appear in the general revenue fund as a transfer for grants-in-aid or be embedded in any number of intra-university transactions between athletic accounts and other accounts. In the last 17 years, 17 schools have entered FBS and not a single one has exited. That is not what a failing industry looks like. If everyone really were too poor to buy talent, who would be buying? The market rate for talent will match the demand for talent, and if schools are broke, eliminating payment caps won’t change the price much. Every major university has an annual budget in the hundreds of millions or billions. Athletic spending is usually a tiny fraction of that budget, especially at the “poor” schools. The decision to spend big (or small) on college sports is not a function of overall revenue. It is each school’s choice. The price-fixing inherent in scholarship caps doesn’t help Ball State compete with Louisiana State for football talent. Instead, it ensures that when Louisiana State competes with Oklahoma State, everyone pays the Ball State rate. FBS football will continue to have tiers of varying quality. Even in a world where players get paid, the lowest tier will pay mostly in scholarships, plus a share of their comparatively small TV revenues. Today’s dominant schools—the ones in the conferences paid billions to be on TV every Saturday—will offer far more in revenue splits, just as today they offer higher-paid coaches, bigger weight rooms, and greater media exposure. With money, as with every other benefit, the market will reward better talent more richly without cutting out all opportunities for the rest. Myth No. 4: This is all a pipe dream, because Title IX makes payments to male athletes illegal. I’m not a lawyer or an expert on Title IX. I am an economist and I rely on data. I can see, empirically, that Title IX has changed the landscape of women’s sports in this country for the better. But it comes with its own myths that empirical observation easily dispels. These reports have it all wrong. First, it’s not true that Title IX requires every woman to get the same scholarship as every man. We don’t see anything close to 98 women getting full scholarships at FBS schools, although those same universities regularly dispense 13 full men’s basketball scholarships and 85 full football scholarships. In 2009–10, for example, all 82 scholarship football players at Florida State got the maximum allowed award, while FSU’s women’s scholarships averaged 68 percent of a football grant. And no one sued Florida State for this disparity because individual-level inequalities like this do not violate Title IX. Second, Title IX does not mandate equal spending on men’s and women’s sports. In 2009–10, Alabama spent $43 million on men’s sports and $13 million on women’s athletics. Alabama was not sued for violating Title IX and wasn’t unusual. All 66 BCS automatic-qualifier schools spent more on men’s than women’s sports that year, and each of them paid men’s team’s coaches more than women’s team’s coaches. Third, it’s as yet unclear what Title IX will have to say about competitive royalty payments. Like all federal laws, Title IX is complex, but boiled down, the money element of the law says that aggregate spending on financial aid has to be “substantially proportional” to levels of participation between men and women. Title IX also aims for the gender of sports participants to mirror the undergraduate population as a whole (which more often than not is majority female), but other options besides true proportionality allow FBS schools to have more men playing sports than women. Thus men get more than half of the scholarship money even when financial aid is proportionate to participation. I am not saying that any of this is good or proper, just that it is empirically true. Payments to athletes under Title IX could go one of several ways. Experts Linda Carpenter and Vivian Acosta have suggested that Title IX might be satisfied by each athlete earning the same percentage of his or her team’s revenues, which would not look all that different from the disparity in coaching pay that exists despite Title IX. Alternatively, Title IX might treat royalties like scholarships, where women get about 40 cents of every dollar of athletic aid. If Title IX were enforced as a truly equal gender split—to be clear, it is not treated this way today—then a hypothetical football player worth $100,000 would only get $50,000 and his sisters-in-arms would share the other $50,000. It would act like a 100 percent payroll tax, and would generate a tidal wave of new funding for women’s sports scholarships, $1 of aid for every new dollar paid out to men. Let’s travel to the world without price-fixing, where schools or conferences make payment choices on their own. What can we expect? Kentucky basketball coach John Calipari might push the envelope first, promising recruits a percentage of royalties earned from broadcasts of their sophomore season to encourage them to stick around an extra year. Perhaps Oregon State football will experiment, putting some of its Pac-12 TV riches into trust funds for athletes to compete against Oregon’s use of glass palaces and slick uniforms. Some school might offer the next Jameis Winston $150,000. Perhaps we’ll see very little Title IX impact at all. Or maybe Title IX will be enforced more strictly than it is now, so our future Winston might net only half that amount with the rest funding larger women’s scholarships. College football and basketball will end up like other leagues in which there is economic competition. In Europe, soccer players in the five major national leagues earn between 40 and 65 percent of revenue. In the United States, where competition occurs between monopoly leagues and monopoly unions, we see 50/50 splits. Fans complain about paychecks and ticket prices, but they haven’t stopped attending or watching games on TV. In our dynamic economy, markets adapt flexibly to new circumstances. In 1988, the Berlin Wall seemed a permanent feature of global geopolitics. A year later, it was gone, and the free market spread east, but slowly at first. Once the market took root, some looked back fondly to when economic competition wasn’t quite as fierce. But almost 25 years later, most would agree that the change was for the better. For college football and basketball, when the price-fixing wall finally falls, tomorrow will be much like today. Over time, America will absorb its collegiate version of East Germany, bringing college sports into a market-based economy, keeping the best of those games but jettisoning the anticompetitive conduct. But for now the wall is still in place, and it’s time we chip away at the myths that have kept it standing.